While Yale now leads the 132-game series 65-59-8, Harvard is currently enjoying a nine-year winning streak. But Harvard’s current prowess on the gridiron doesn’t extend to the management of its now $36 billion endowment—the largest in the world. Yale has outperformed Harvard for six years in a row, and Harvard has slid toward the back of the Ivy League class. 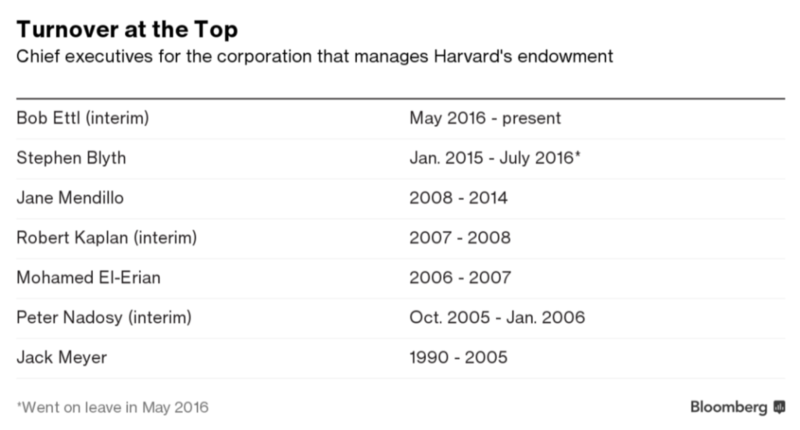 Over the five years ending June 30, 2015, Harvard’s annualized investment return was almost four percentage points below Ivy League-leading Yale’s return of about 14%, lagging all of its peers except Cornell. And this year’s results were equally disappointing, with Harvard posting a 2% investment loss (or $1.9 billion) compared to Yale’s 3.4% gain, its worst performance since a loss of 27.3% in 2009. College and university endowments tracked by Cambridge Associates posted a loss of 2.7% for the year ended June 30. The S&P 500 return over the same period: positive 3.25% (source: FactSet). Over a longer 10-year time horizon, the results are roughly the same: Princeton, Columbia and Yale are all clustered at the top with annualized returns of about 10% while Harvard sits near the back of the pack with a return of 7.6%—about 25% lower than the Ivy League leaders. The chart below reflects endowment sizes and returns through the fiscal year ending June 30, 2015, and do not incorporate the recently announced results for fiscal 2016. What’s going on here? There are several explanations and one big takeaway. Let’s start with a brief history. Back in the 1990s and early 2000s, Harvard and Yale both posted stellar returns under Jack Meyer and David Swensen, respectively. They followed the same general strategy of diversifying away from plain vanilla marketable securities, such as stocks and bonds, to more exotic fare, such as private equity and hedge funds. For example, in 1985, 65% of Yale’s endowment was allocated to U.S. equities, but in 2016, its target domestic equity allocation is just 4%. The rationale for the change, according to Swensen, is that an endowment’s long time horizon is “well suited to exploit liquid, less efficient markets.” Swensen’s Pioneering Portfolio Management: An Unconventional Approach to Institutional Investment explains this approach, which came to be known as the “Yale Model” or the “endowment model” of investing. 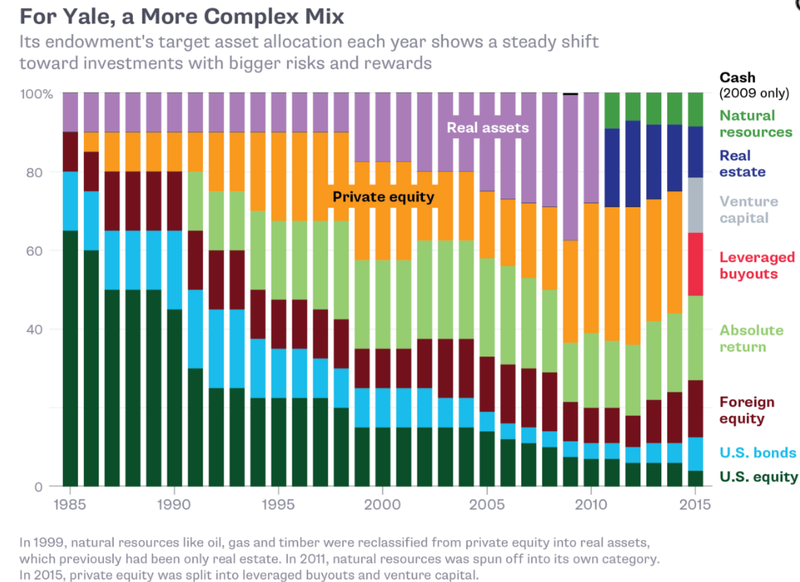 The chart below illustrates the extreme changes in Yale’s asset allocation over time. Under Jack Meyer, Harvard followed the same general strategy but with one significant twist: It operated a hybrid model, allocating money to external managers and using internal managers. By contrast, under Swensen Yale has always farmed out all of its money to external managers. Harvard’s internal managers initially did an outstanding job. In fact, they were so exceptional that a number of them earned between $10 million and $30 million a year, resulting in an outcry from faculty and some alumni. Eventually, the malcontents won. So Meyer left to start his own hedge fund—with a major anchor investment from Harvard—and then, chaos ensued. Since Meyer’s resignation in 2005, Harvard Management Co.—which manages the endowment—has had three interim heads and three permanent heads. Following Stephen Blyth’s unexpected departure in July 2016 for medical reasons, the Harvard endowment is once again under the stewardship of an interim leader and searching for its fourth head in a decade. Meanwhile, Swensen has been running Yale’s endowment for the past 31 years. Harvard has experienced some notable and embarrassing stumbles along the way. In the credit crunch of the Great Recession, Harvard lost 27.3% in the 2009 fiscal year alone. Then Harvard Management Co. head Jane Mendillo oversaw the sale of private equity investments at fire-sale prices to raise cash, and Harvard even had to issue a bond to further shore up its cash position and meet its funding obligations to the university’s operating budget (one-third of which is provided for by the endowment). Yale similarly mismanaged its cash position during the financial crisis, even venturing into negative territory. This led to an existential questioning of the endowment model, a retreat that we believe was uninformed. In 2010, we addressed this concern in a white paper, “The Yale Endowment Model of Investing Is Not Dead.” In fiscal 2017, Yale’s combined cash and bond allocations will be capped at a 7.5% allocation. Under Swensen, Yale’s performance has been spectacular, and it has inspired a trend, spawning imitators who aspire to replicate the school’s achievements. The old norm was a balanced portfolio of 60% stocks and 40% bonds. Now, many institutions are following Yale’s lead, reducing their holdings of marketable securities and replacing them with illiquid assets such as private equity, private real assets and hedge funds. These assets, known as “alternatives,” now compose about 60% of the largest endowment portfolios, according to research from Vanguard. The results have been predictably mediocre. Examining investment horizons in 5-year intervals ranging from five to 25 years, Vanguard found that “the majority of endowments would have been better off had they invested in low-cost, diversified, transparent public mutual funds.” Ouch. Considering Harvard’s humbling returns over the past 10 years—not to mention this year’s embarrassing loss—it’s well past time to end the drama and get out of the headlines. Harvard should eliminate its internal managers—if for no other reason than to avoid the politics associated with directly employing highly compensated investment professionals—and radically simplify the endowment’s investment approach. 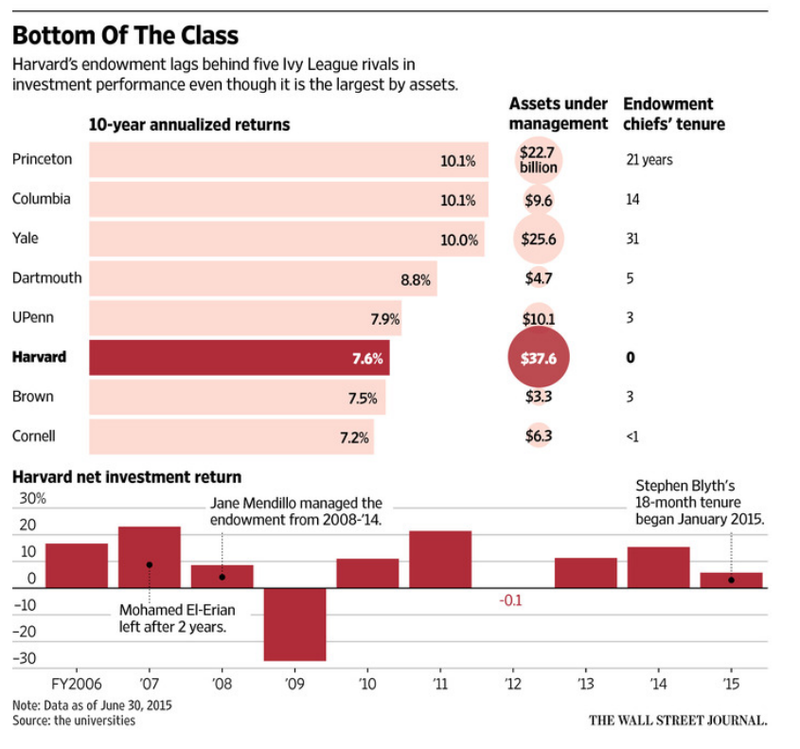 Like most other endowments, Harvard could do worse than a 60% stock/40% bond mix. College endowments need to own cash and bonds to fund their commitments to their schools’ operating budgets, which have steadily ratcheted up over the last two decades A $36 billion endowment that’s almost always growing, thanks to alumni generosity, can easily generate adequate returns to fund Harvard’s obligations to the university’s operating budget—and then some. The availability heuristic is a mental shortcut that relies on immediate examples that come to mind when evaluating a specific topic, concept, method or decision. Under the availability heuristic, people tend to give recent information the most weight when making judgments. For the past two decades, Yale’s remarkable returns have been the “new information” that has been heavily weighted by endowment trustees seeking to replicate the Yale Model. But research from Vanguard and others has shown that the imitators have fallen woefully short of their aspirations. Long-term perspective—the antithesis of reacting to recent information—is one of the iron requirements for investment success. From that perspective, a simple approach to asset allocation is not simplistic; it’s simply better.